Mizuki: My name is Mizuki Sakamoto, and I am a 1st year masters student at Waseda University in Japan. I'm studying Computer Science and Engineering specializing in Human Computer Interaction. Kimisha: I’m Kimisha Mody, a final year Computer Science student from Nanyang Technological University, Singapore. Alice: Hola....My name is Nhlanhla Alice Ntuli, a masters student from South Africa studying Computer Science and Engineering in Konkuk University, South Korea. What was the highlight for you? What skills did you gain? Mizuki: I gained the skill of communicating my ideas. Through the hackathon project where I worked with two other scholars from different countries, I realized that the more ideas we exchange, the more advanced our application's concept becomes. Developing an application with female students from different countries was exciting for me! Kimisha: The hackathon with my team members from Korea and Japan was the highlight! Our task was to collaborate across different time zones, manage time and work together within a tight deadline to deliver an effective presentation. It has definitely honed my speaking and presentation skills. We also had a resume and interview skills workshop, which gave us several tips on writing an effective resume and giving the perfect technical interview. Alice: I especially had a lot of fun meeting women like me from different countries. Everyone was full of energy and enthusiastic, being surrounded by them really uplifted my spirit and the level of confidence. How do you plan on applying these learnings/skills to what you do back at school? Mizuki: The skill of explaining your ideas is important in academic research. I’m planning to create a lot of opportunities to talk with other people to advance this skill. Kimisha: Working together with team members, thinking on my feet and resolving issues are certain skills that come only with practice. The resume and interview skills workshop will be particularly useful for various technical job interviews. Alice: I was really impressed with the work that my roommate has been doing and we decided to collaborate on a research paper since our two research areas complement each other. The retreat opened my eyes to many possibilities. I understand the beauty of collaboration with others, all thanks to the Hackathon. My professional network has expanded, I intend to apply collaboration skills I learned to all my future projects. Mizuki: I will continue my gamification research. I would like to develop a value-based gamification framework to help people think positively. Kimisha: To work in a dynamic environment and contribute to solving practical problems! I wish to work for a few years in the Software Industry. Alice: I hope to get an internship with Google as a Software Engineer. I just started working on my thesis trying to finalize the topic, I am so full of ideas that came to me during the retreat, hopefully I will settle on one topic soon. What is your advice for prospective Anita Borg scholars? Mizuki: Go where your passion takes you and believe in your own possibilities! Kimisha: Don’t feel shy to showcase your capabilities. All you need is a great passion for Computer Science and a medium to showcase it! The Anita Borg Scholarship will no doubt be your best platform to do so. Alice: Be sure to highlight what makes you unique. I cannot count the benefits of being a Google scholar. It's simply a life changing experience, I invite you to try it. 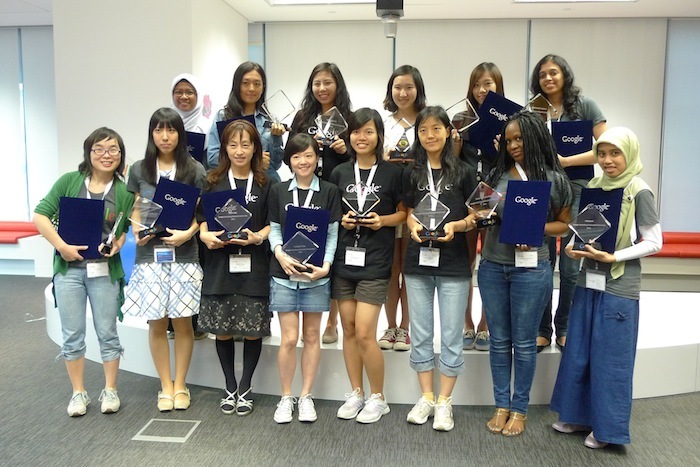 We were thrilled to invite 14 top Computer Science students who attend universities in Japan, Korea, and South East Asia to the 2012 Google Anita Borg Memorial Scholarship Retreat. From September 3rd - 5th, the Scholars gathered in the Singapore office for three days of workshops, technical talks, a poster session, panel discussion, a hackathon and lots of networking opportunities. Three scholars, including Mizuki Sakamoto, Kimisha Piyush Mody and Nonhlanhla Alice Ntuli, shared their excitement. Google Singapore has done a great job by conducting three days of workshop which has given handful of experience to candidates who have attended it, an opportunity to learn new technology and meet the experts of google. This would boot their career and give more confidence which will help them to get good jobs after completing there courses. 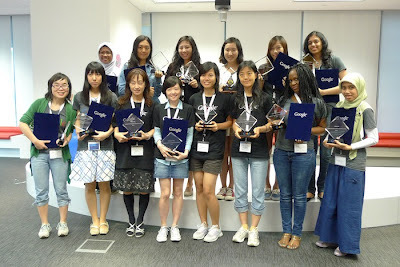 I hope Google Singapore hosts workshop every year which will help students to learn new technologies from this.